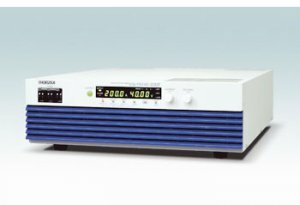 The PAT-T Series is a constant voltage/constant current, auto-shifting, switching DC power supply. It features a soft switching system that offers greater efficiency and lower noise. At the same time, it makes full use of high-density packaging technology to reduce the unit’s size and weight. The chassis is the standard rack width (430 mm), and is about 130 mm (3U) high and 550 mm deep. The output power is 8 kW. Compared to series regulated products of the same capacity, it is about 1/6 the volume and 1/7 the weight. While offering a high output of 8 kW despite its small cabinet size, it also features a “power factor correction circuit.” With a high power factor of 0.95, it improves the power environment (suppresses harmonic currents) and also greatly contributes to "energy saving," as exemplified by its simplified and miniaturized power reception and distribution modules, and overall lower power consumption. Standardly equipped with RS-232C interface. Controllable from Excel VBA and LabView with measuring instrument driver. Capacity can be expanded through parallel operation (up to five units of the same model). Equipped with reliable output ON/OFF delay function during sequence operations.